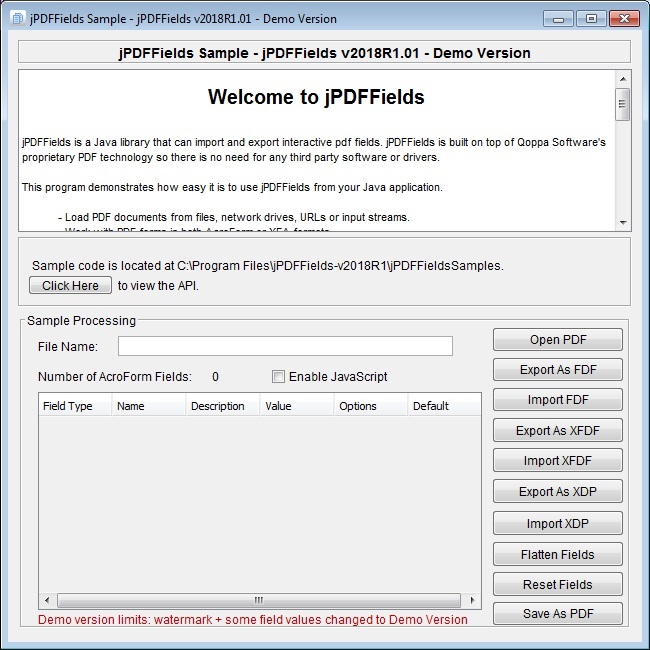 PDFFields is a Java library to work with interactive PDF forms in both AcroForm and XFA formats. jPDFFields allows your application to get and set field values and can also import and export to FDF, XFDF, and XDP formats. Additionally, jPDFFields can also flatten fields in a document. Flattening is the process of merging the fields into the PDF content layer so that the information is retained but as static PDF content. jPDFFields is built on top of Qoppas proprietary PDF technology so you do not have to install any third party software or drivers. Since it is written in Java, it allows your application to remain platform independent and run on Windows, Linux, Unix (Solaris, HP UX, IBM AIX), Mac OS X and any other platform that supports the Java runtime environment. Load PDF documents from files, network drives, URLs or input streams. Work with PDF forms in both AcroForm or XFA formats. Export fields data as FDF, XML (XFDF) or XDP files. Import fields data from FDF, XML (XFDF) or XDP files. Flatten form fields (paint the fields content directly in the page and remove fields themselves from the PDF document). Reset fields to their default value. Save updated PDF file as file, an OutputStream or a ServletOutputStream.